I am continuing to work on quilts for West, Texas. Almost all of my own sewing has come to a stand still. I did pull out my May UFO which is #10. In between everything else, I am going to try to work a bit on it too. Here it is….Cactus Patch from Bonnie Hunter’s Scraps & Shirttails: Reuse, Re-pupose, Recycle! The Art of “Quilting Green” . I have worked on it earlier in the year and made some progress. Then I slowed down again because I am coming to the part where I have to make a decision. It seams that is where I always get stuck. The fabric at the top of the picture is gold. Bonnie made hers using a gold fabric. Part of me really wants to use yellow instead. Kelli thinks I should use black. I am at a cross roads. With out a decision getting made, I can’t do much more. Part of me just thinks use the gold it’s here…. I don’t have a lot of hope that I will actually finish it this month-these West, Texas quilts are taking all of my time, but at least getting the UFO pulled out will be a step towards progress…right?? We have giveaways happening. 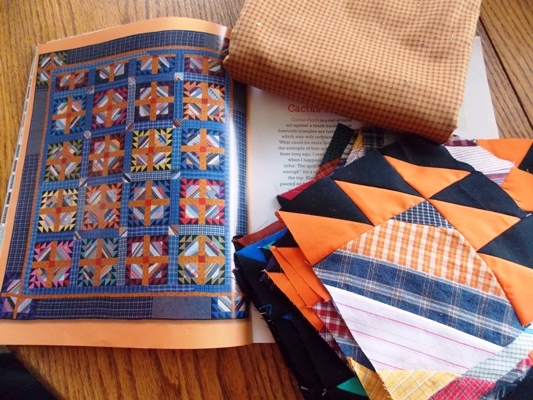 Here is a link to win a copy of Quiltmaker’s 100 Blocks Volume #7 , link to win the book “Pieced Hexies”. and the Between Heaven and Texas giveaways. This entry was posted in Quilting, What I'm Working On on May 6, 2013 by Jo. i would choose the gold check if it were up to me. if you have some floor space available, lay down rows of each of the different fabrics (gold, yellow, and black) with each row wide enough to hold a matching set of 4 blocks. place the sets of blocks on top of the rows of fabric, and it will allow you to see how each of the different colored sashings would appear before you cut. My thoughts are go with what you want. Yellow would be great. You can see in your mind how to finish it, it will be slightly different that Bonnie’s and you will love it. Never force it unless you are working on stretching yourself. I like the gold check but it kind of depends on what you are using for the other sashing (where Bonnie has blue). You might not want two strong colors which might happen if you use black. This is going to be a very pretty quilt. Ultimately, if it were my quilt, I’d use whatever I had to get it finished sooner! Good luck. I think the gold check looks good with your fabrics, but I like the other ideas too. I would cut a strip or two of each color you are considering and stick them up on the wall with your blocks so you can see how they work together. I have several projects stashed away because I got stuck on trying to make a decision. I like the gold check–but as a final decision there’s either einey, meiney moe or rock, paper scissors! Hmmmm…that is kinda tough! I’m kinda leaning toward the gold check too. But, Judy Hansen’s post is what I would have recommended…almost word for word! Especially the taking of the picture. I would also love to see all the options. Sometimes a fabric or color will surprise you! Good luck with your decision! That is a beautiful pattern and I always try the fabrics that I want to use and just stare at it, if it looks pleasing to the eye, I use it. I like the gold, too, but suggest you test out the yellow. You have made good decisions when changing from Bonnie’s colors before, so stick with your preference. Yellow or black would standout like in Bonnies quilt. I think you should use the color that you feel most comfortable with. It is a beautiful pattern.